The study of the Physics of Elementary Particles and Fields for most people is often constrained by the complex nature of the subject and limited exposure to the basic constructs of the general ideas, language and experimental methods. Planting the ideas of particle physics is fascinating, but sometimes only smashing atomic particles together allow you to harvest the understanding. This presentation will provide an introduction to the basic concepts, some technical equipment and the general scale of this academic field that explores the very small underpinnings of the most fundamental constituents of our very large universe. 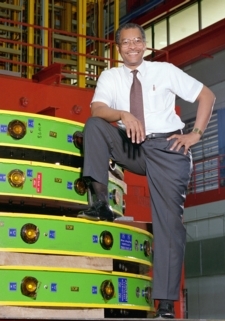 Herman White has been a particle physics scientist with Fermilab for the past 33 years. He completed undergraduate studies at Earlham College, graduate studies in Nuclear and Accelerator Physics at Michigan State, and Elementary Particle Physics at Florida State University and Yale. He was a Resident Research Associate in Nuclear Physics at Argonne National Laboratory for a period in 1971, an Alfred P. Sloan travel fellow at CERN in 1972, and University Fellow at Yale from 1976-78. His research has covered a range of topics in Particle and Nuclear Physics, as well as work with Accelerators and Particle Beams. In addition to his Scientist position on the Fermilab staff, for the past 13 years he has also served as an Illinois Research Corridor Fellow and Adjunct Professor of Physics at North Central College. For many years, he has maintained involvement with many communication efforts to bring information, concerns, and focus about Physics and physical science research to the US Congress and governmental agencies in Washington and elsewhere. He has also been engaged in Physics and science education for a number of years, including membership in many American Physical Society committees on Education, Particle and Fields, and communication, as well as Advisory Boards for the QuarkNet Project and the Illinois Institute of Technology Department of Biology, Chemistry, and Physical Sciences. For the past few years, he has also made invited presentations to the Business and Law school students at the University of Caen in Normandy, France on the value of science in their professions, and also contributes to his regional community as a member of a number of corporate governing Boards of Directors including the Teacher Academy for Mathematics and Science in Chicago. He enjoys photography, travel, sports, and the performing arts. He is featured in the IMAX film "Cosmic Voyage," nominated for an Academy Award in 1996 (Documentary (short subject) category). He is also a member of a lecture group known as "The Three Cosmic Tenors" along with physicists Professor Larry Gladney of the University of Pennsylvania, and Professor S. James Gates, of the University of Maryland. Their inaugural three lecture presentation, "Exploring the Frontiers of Matter, Energy, Space and Time," occurred at the Field Museum of Chicago, 2006.